I have a Japanese stonecrop plant. The leaves are falling off sooner than expected. Been putting it in sunlight all day and still nothing has improved. How do I save the plant? I don't know much about your climate, but in the northern hemisphere, these plants are tough, and take a lot of cold, including snow and freezing temperatures. If you never get that cold, it will still try to get ready for winter, usually triggered by light levels. 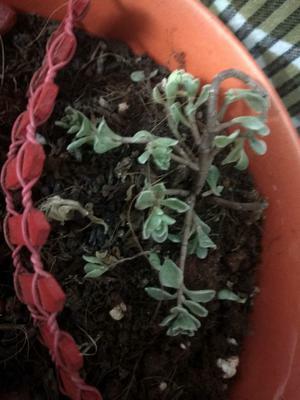 Most Sedum spurium types, similar to this one, regularly lose their leaves in the cooler temperatures of fall, then regrow a whole lot of new stems in the spring. If it's Sedum cauticola, another plant that goes by the name Japanese Stonecrop, these typically don't lose their leaves, but they do go dormant. Be patient. Maybe have a look in the center of the plant to see if there are new buds forming. Also, let the soil dry out a bit. Sedum don't like or need lots of moisture around the roots, and this soil looks like it could be fairly high in compost.